My childhood desk’s new life. 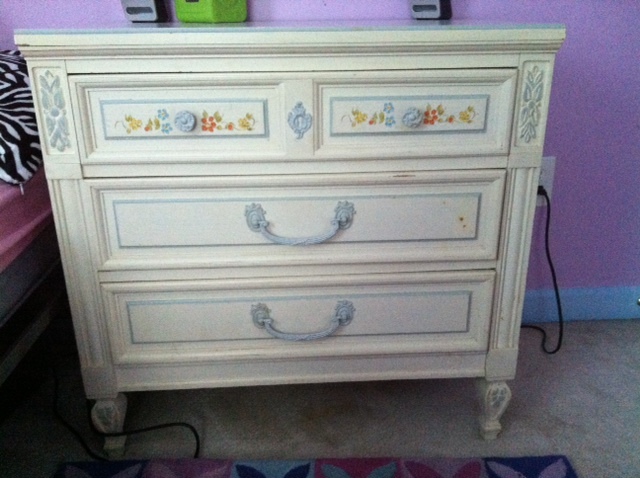 With all furniture re-doing around here, the second daughter (Cori) was bound to want something for herself eventually. 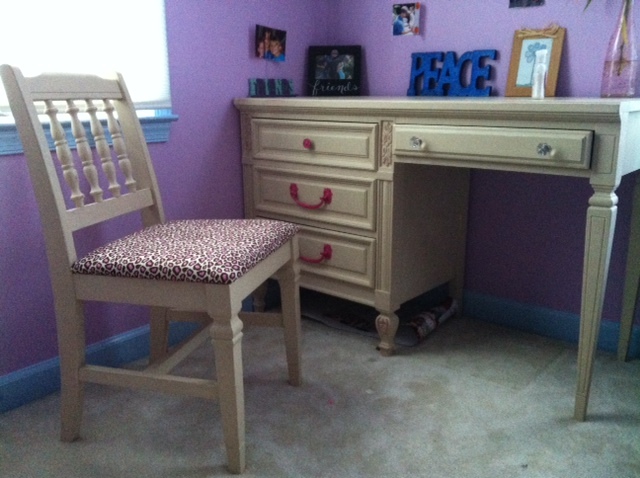 She finally said something, spurred on by my asking and it was decided she’d like a desk. 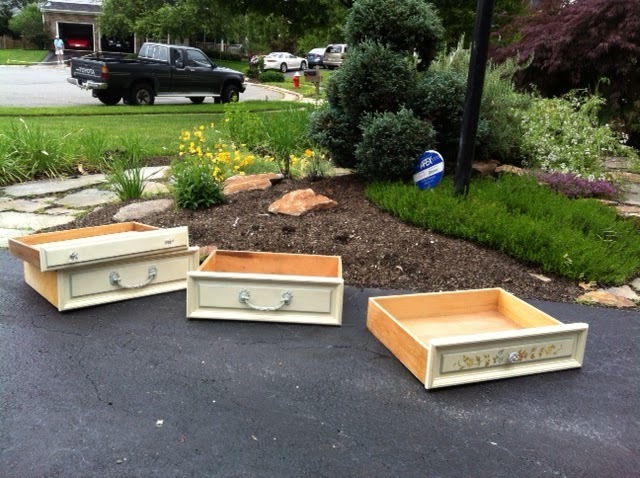 We searched Craigslist… missed out a few super cute ones and finally found something. I bought it… and she changed her mind. Hrmphhh…. ok…. However, then she did something surprising. She decided she wanted the desk in the garage. Now the desk in the garage was part of the furniture collection my parents purchased for me when I was a budding tween and it’s ok… The desk is in great shape, it is great quality and all, I just think it is ugly. I always thought it was ugly. It has these weird orange flowers and I have never liked them. See? Cute, and yet… ugly..
ok, so what do we do with it? Well, this girl has a wild streak. She LOVES animal print. The tackier and louder the better. She is full-on, throw-back to the 80’s. So I thought fabric would be the best place to start. So we headed over to the trusty internet and found some acceptable cheetah print (and super cute I might add) and ordered that. It finally got here and I bought paint and then got busy. So it sat. Then about a week ago I got a wild hair and just started it one afternoon. 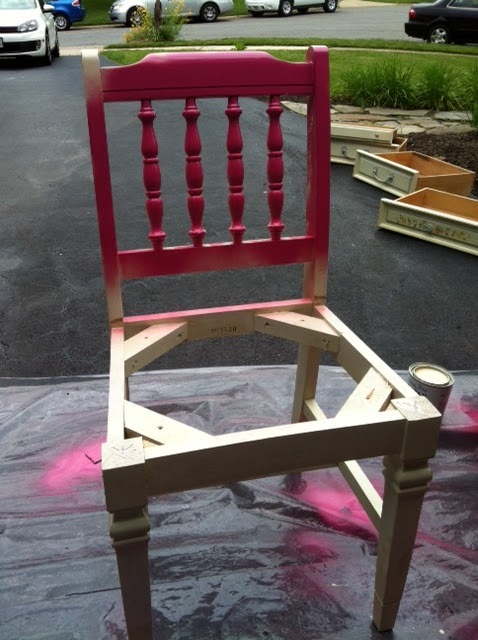 The cute little girl at my favorite antique store where I buy my fabulous ASCP had the brilliant idea of using spray paint under the regular paint to distress to a color that would work better for Cori. So off to the big box store for spray paint. You don’t normally need two coats of paint. I went ahead and did two coats any way. I wanted the pink to be good and covered and I wanted to make sure the old white and blue colors didn’t bleed through. Once those layers were dry I threw on a quick coat of wax and then took a piece of medium grit sandpaper (180 I think) and gave a quick swipe to a few of the areas that had the pink spray originally. One more coat of wax for protection and it was done. 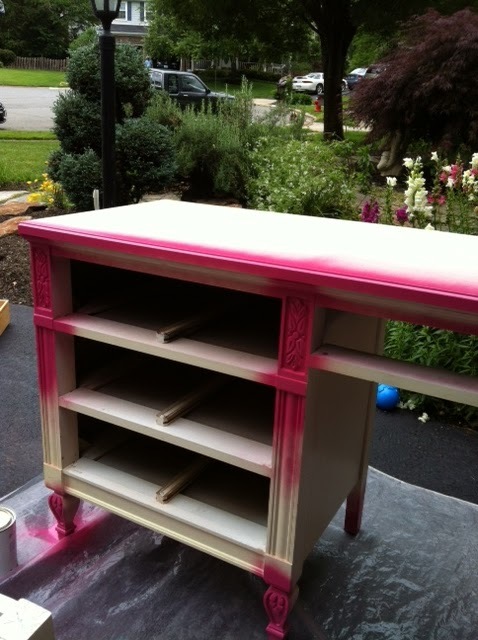 I firmly believe if you’re going to do something, you might as well go crazy so I took the spray paint and gave a quick pass to the insides of the drawers and the hardware too (after I removed it front he drawers). Then two coats of paint and wax on the drawer fronts and the hardware was dry so I gave that some quick wax for protection and rubbed a little hard in some spots just to give them a minor distress. 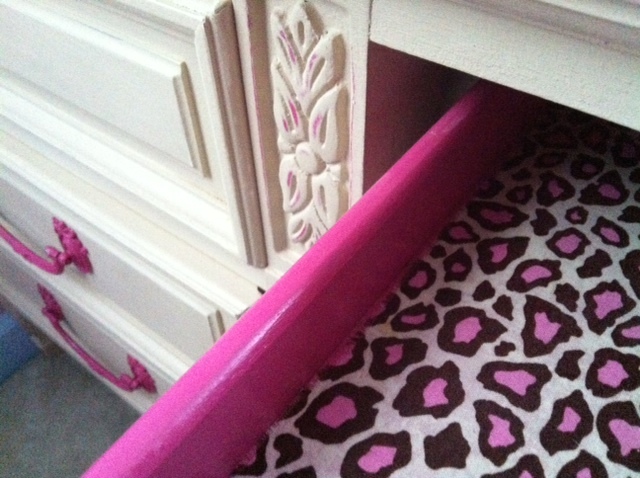 Once it was all dry I took the fabric I had used to recover the chair and cut pieces to fit the bottom of the drawers. 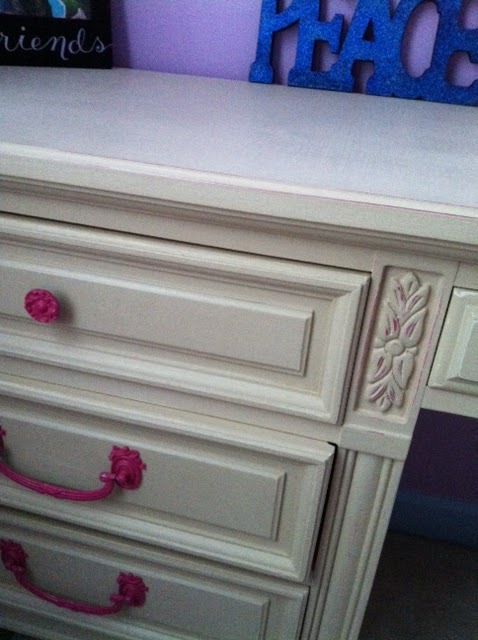 A coat of Mod Podge and quick sanding to finish them off and the drawers were ready too. I just love the way the woodwork is highlighted with the paint distress. The hardware stands out so well too. All in all, I am pretty pleased with this one. Just wait.. some lady gave me a bar height table (with leaf) and 6 chairs the other day… Brian is going to kill me, but I plan on selling them on Craigslist when I’m done, so that’s got to be ok, right? I already re-did one of the seat covers and bought the paint this morning. I love it! Especially the cheetah print! Thanks! It’s the best thing I have done so far- I am really proud of it. Can’t wait to get that nightstand done, it’ll just have to be after this table you’ve got me inspired to do.